NPO Trio is Meg Okura(violin), Sam Newsome (soprano saxophone) and Jean-Michel Pilc (piano and its debut is an often dazzling, free-wheeling, improvisational collection titled “Live at The Stone” (Chant Records). Ms Okura, born in Japan, is married to Mr. Newsome and both have known and played with the pianist for the past two decades. 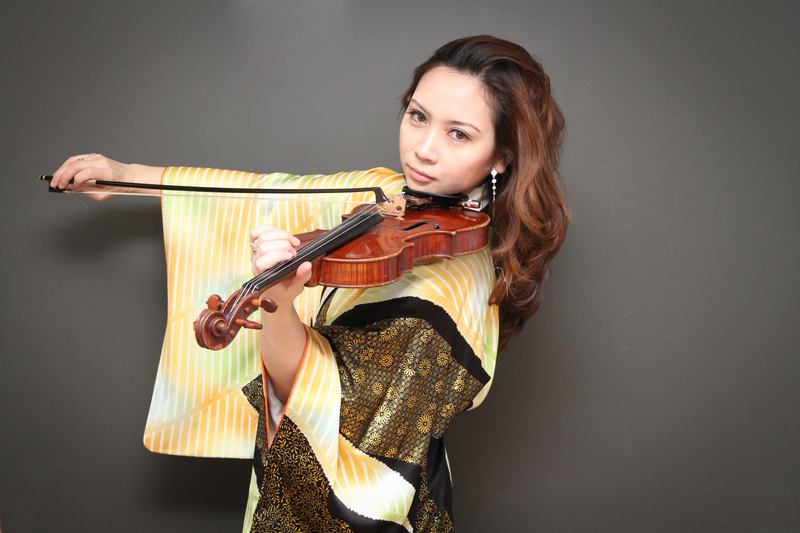 After her move to the United States, the violinist converted to Judaism. Besides leading various ensembles (including her Pan-Asian Chamber Jazz Ensemble and the J-Orchestra), she has worked with a wide variety of musicians, from the late Michael Brecker to the Jewish/Middle Eastern band Pharaoh’s Daughter. The album features three fascinating musical adventures including the untitled six-part, 49-minute suite that opens the program. Based on the Yiddish tune “Oyfn Pripetchik” (a song about a parent teaching her children the alphabet), the music is often spell-binding aa the piano rolls beneath the high notes of the violin and the soprano sax alternately wails and sighs. The opening section, “A Four Forty“, is the prelude: about five minutes in, the original melody makes its first of numerous appearances. The plaintive tune rises out of the din of the aptly-titled “Bells, Whistles, and Sirens“, after the riveting piano, the hard-edged soprano, and the high-notes of the violin have taken the listener on a journey through a chaotic world. Along the way, the musicians portray a world where so many people are dealing with relocation with the hope of a new life (“Travels” and “Exodus and Emancipation“) – the journey the trio “plays” is not an easy one but fragments of the original melody help to soothe the troubled heart. By the time you reach the last section, “Pleading” (which is mostly a duet for soprano sax and piano), you begin to understand that this is not the climax of the journey but that your plea is a prayer fore the strength to go on. Newsome’s tremendous range of notes and emotions are amazing to follow, to be absorbed in, to be able to tell such a powerful story that one hangs on every note. The track following the suite, “Unkind Gestures“, is the shortest improvisation (6:54) but its power comes from its anger and the musicians attempt to reconcile that emotion the power of creativity to transform the players and the listeners. If you listen closely, on occasion you hear snippets from John Coltrane’s “Giant Steps“, the melody line often fragmented but recognizable. “Yiddish Mama No Tsuki“, the final track, combines Ms. Okura native and adopted heritages taking two songs dedicated to mothers which the trio play and then create variations. It opens with solo violin followed by solo piano; then, Ms. Okura and Pilc play a tango which Newsome’s “clicking” soprano joins after a moment. It is fascinating to hear the soprano saxophonist go from the keys clicking to a soaring melody to an abrasive set of sounds and back to melody. The trio changes directions and moods several times during the last half of the piece, closing on a rippling piano line, more clicking saxophone, and chords plus the violinist hitting the strings with her bow . One hopes that is just the beginning for NPO, that Meg Okura, Sam Newsome, and Jean-Michel Pilc continue to play together, to make challenging and such rewarding music. “Live at The Stone” is an aural magic show that reaches for your heart and your mind. Chant Records has released two new recordings led by violinist and composer Meg Okura, her improvised concert with husband Sam Newsome (soprano sax) and pianist Jean-Michel Pilc(“NPO Trio“, reviewed here) and “Ima Ima“, a studio recording by her 10-member Pan Asian Chamber Ensemble. It’s quite an engaging project that blends the sounds of Newsome’s soprano sax, Tom Harrell (trumpet, flugelhorn), Sam Sadigursky (clarinet, bass clarinet), and Annie Drummond (flute, alto flute, piccolo) with the rhythm section of Brian Marsella (piano, electric piano), Rez Abbasi (guitar), Pablo Aslan (bass), and Jared Schonig (drums) plus several appearances by Riza Printup (harp). The album’s title combines Ms. Okura’s native upbringing (“ima” means “now” in Japanese) with her adopted religion (“Ima” is “mother” in Hebrew) while the music blends her myriad of interests, from the folk and classical music she grew up with as well as the jazz that is her passion and life. The title track has a lovely melody line that is supported by an active rhythm section. Ms. Drummond’s flute blends with the soprano sax and violin introduce the main theme before Newsome steps out for a lengthy and far-reaching solo. The composer’s impressions of her time in Israel are the basis of “A Summer in Jerusalem“, a piece that opens as a sound montage: then the bass clarinet introduces the bass line and the ensemble powers forward. The arrangement shows the strong influence of Gil Evans behind the strong solos from Marsella (electric piano), Abbasi, and the leader. After Ms. Okura brings her an end, everyone drops out save Ms. Printup’s harp. She introduces the fine flugelhorn solo while the ensemble slowly climbs back into the picture (note the lovely wordless vocal from Ms. Okura). One can hear Japanese influences on “Tomiya” what Ms. Okura describes n the liner notes as a taiko-drum rhythm: yet it also sounds like a tango plus there is also a mainstream jazz feel. It’s so enjoyable to hear there arrangement opens to allow each voice to have a piece of the melody. Both Harrell and Ms. Okura solo yet the multi-sectioned piece allows for tempo changes and delightful interplay. Another episodic work, “Birth of Shakayamuni“, has its roots in Buddhism. The sprightly melody is passed around from bass clarinet to flute to piano to violin before the piece moves to a solo section for Sadigursky’s clarinet. More th intelligent backing from the guitar and harp. Abbasi’s solo comes over a rapid-fire rhythm then gives way to a fiery solo from Ms. Drummond. The violin leads the way on the final section but, again, each voice in the ensemble has a piece of the melody. “Black Rain” takes its inspiration from the atomic bomb attacks that brought World War II to its shocking conclusion. The poignant melody is shared by the soprano saxophone and violin. Yet, like the other pieces, the melody moves around until Marsella’s captivating solo that opens with a more traditional Japanese feel before moving on. Before Ms. Okura takes her solo, she shares a short conversation with the flutist (listen to how they move around each other with trills and musical curlicues). “Ima Ima” makes for engaging listening. Filled with strong melodies, excellent arrangements, and fine musicianship, the album is a journey inward and outward with Meg Okura telling her young daughter the story of her ancestors, the story of the challenges her mother went through to come to the United States, and how hard it was to begin a new life. There is no bitterness, no losing faith: instead, the music can be viewed and listened to as a celebration of survival, renewal, and hope for a brighter future.